As the title implies, this is the third installment to a series I started several months ago that discusses the various factors that can help improve our HRV. The first two posts can be read by clicking on the respective links below. I will first discuss (very briefly) some research and the key physiological adaptations that occur in response to aerobic exercise as it is these changes that ultimately affect the function of the autonomic nervous system (ANS). I will then provide some thoughts on how to include aerobic work into your training in effort to improve our overall health, recovery and capacity for training. Like always, I will include some anecdotal experience and a bit of theory. This article is primarily directed at strength athletes/individuals. It’s important to clarify what exactly I’m referring to when I saw “aerobic exercise”. For the purpose of this article “aerobic exercise” is referring to some form of activity that maintains an elevated heart rate above resting conditions. This is a very broad and vague definition but for good reason. Depending on one’s current physical condition, aerobic work may be simply going for a walk, while in very fit individuals aerobic work may include longer distance running, swimming, cycling, etc. It can be tempo runs, circuit training, sled work, mobility drills or dancing if that’s your thing. Children (age 6-11) who initially had low HRV scores saw significant increases in HRV after participating in a 12-month moderate exercise program (Nagai, 2004). Elderly sedentary folks (men and women between 65-75 years old) saw an increase in HRV and cognitive test scores after 12 weeks of aerobic exercise (1hr/day, 3d/wk) compared to a group who performed only stretching (1hr/day, 3d/wk) of which saw a decrease in cognitive test scores (Albinet et al, 2010). I should mention that there are several studies that showed no improvements in HRV following exercise intervention. It appears that there is a threshold of exercise intensity required to augment vagally mediated HRV. Essentially, it’s important for heart rate to remain elevated beyond a certain level for a certain amount of time performed consistently over a certain time period for noticeable HRV changes to be seen. I realize that last sentence didn’t help anyone but I don’t believe this threshold level has been clearly established. My interpretation of the research that I’ve seen is that you simply need to be consistent and put more effort into it than a leisurely walk, although that may be a good start for some. Older people generally require longer exercise interventions as sympathetic activity increases with age. Anecdotally, I can say that when I incorporate regular active recovery workouts (moderate aerobic intensity) my baseline HRV score is higher and I see quicker and higher spikes in HRV following an active recovery day. Furthermore, I almost always see decreasing baseline HRV trends when I do not include active recovery work. I can definitely see the corresponding relationship between HRV and aerobic work capacity. When my aerobic capacity is high my HRV is typically higher (baseline level). With consistent downward trends in HRV I’m typically detraining (due to illness, high stress, or anything that results in lack of training). Thus, at least in myself, when my aerobic capacity is higher, my HRV is typically higher. * Note that this does not include acute changes in HRV but rather weekly/monthly trend changes. *I used both the NSCA Essentials of Strength Training and Conditioning text and Primer on the Autonomic Nervous System Text for the above information. I’m reluctant to say that all of the above directly affect HRV. The primary factors from the above list that impact HRV the most would be the changes in Sympathetic and Parasympathetic tone. The ANS is responsible for responding to a stimulus/stressor and creating the necessary adaptations to allow us to resist the same stimulus/stressor in future incidences. Therefore, regardless of what type of athlete you are, improving your overall capacity for stress is beneficial. Our performance can be limited by our capacity for work. HRV score is a reflection of how much stress you can handle that day. Therefore we want to do what we can to position ourselves to better tolerate and adapt to our training. Let me be clear and state that I’m not advising powerlifters or throwers to go for a 1 hour run 3-4x/wk. However, in the interest of increasing workout volume/density and recovery, some aerobic capacity work can be helpful. Louie Simmons and Dave Tate have been preaching this for years. I recall plenty of articles where they discuss sled dragging, “feeder” workouts, etc. You can call this a “base” or “GPP”, “Anatomic Adaptation” or whatever you want. The bottom line is, we need to increase our body’s ability to handle training stress, recovery from it, then handle progressively more training again. I understand that resistance training can elevate heart rate and maintain it over resting conditions. However, can you honestly tell me that you can go play a pick- game of basketball and not be completely winded after 5 mins? I used to not perform active recovery/work capacity workouts. If I did anything even somewhat strenuous for over 20 minutes that day my workout would be ruined. I’d purposely avoid physical activity so that I wouldn’t compromise my workout. Now that my work capacity is much higher I no longer have this issue. 6 min aerobic exercise (incline treadmill, bike, skipping, etc), 5 min dynamic stretches, 5 min lower body mobility, 5 min “activation” type work for glutes and core (due to previous low back issues), 5 min upper body mobility (shoulders, t-spine) and external rotation work, some form of box jump or KB swing to finish. By the end of this I’m sweating and my joints feel great. – Perform some type of activity on your off days. If you have terrible work capacity start off extremely easy with 10 mins of incline treadmill walking or the stationary bike. Over time work up to 20-30 mins. Generally I don’t exceed 40 minutes of work. – Perform mobility circuits and kill two birds with one stone. Improve your mobility and aerobic capacity at the same time. Just keep your HR elevated. – Complexes with BB’s, DB’s or KB’s. Yes, interval work can provide much of the benefits that aerobic exercise has to offer. However, intervals are much more stressful and taxing. Interval work can be better tolerated after a sufficient level of work capacity has been established. If you’re not concerned with strength levels than by all means proceed with intervals. However keep in mind that conditioning work with intervals is not necessarily facilitating recovery and will likely result in a lower HRV score the following day. Assess your situation and goals and make an appropriate decision. If you progress your work capacity properly you shouldn’t see any negative effect on your strength levels. This isn’t about “concurrent” training were we want to build endurance and strength at the same time. It’s more about keeping strength the priority and gradually building work capacity at an intensity low enough that it doesn’t contribute to overall stress but rather facilitates recovery from it. This is how I prefer to do it. Approaching this with athletes in a team setting is a different animal and I will hopefully share my thoughts on that another time as this article is already longer than I wanted it to be. If you have anything to add, refute, share, etc. I’d love to hear it. Comment below or email me andrew_flatt@hotmail.com. I joined Twitter recently so we can interact there too @andrew_flatt. This entry was posted in Heart Rate Variability and tagged autonomic nervous system, heart rate variability, HRV, recovery. Bookmark the permalink. Great article but could you clarify what you would determine as aerobic,do you agree with maffetones approximation of 180-age heart rate? I’d agree with that recommendation. Drawing from personal experience, I saw my highest HRV scores when I would regularly jog progressively from about 25 to 40 minutes (no longer than 40 mins). My heart rate would’ve been in that range (150-160 bpm at 26 years old). I’ve performed lower intensity workouts (<140bpm) and did not see as pronounced increases in HRV. What have you seen with from your experience? . What is it about aerobic training that causes increased parasympathetic tone? Is it eccentric hypertrophy of the myocardium leading to improved efficiency, resulting in a increase in vagal tone? This is a loaded question that I probably can’t fully answer without doing some further research into the matter. For the time being I can offer a few thoughts. Both intrinsic factors (SA node remodeling, increased volume capacity of the ventricles, etc.) 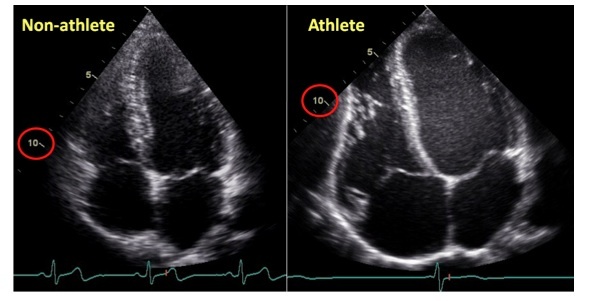 as well as extrinsic factors (increased vagal activity assessed via HF Spectral Power) will reduce RHR and are likely responsible for bradycardia in athletes. These are obviously more chronic adaptations to aerobic exercise. Resting parasympathetic tone will increase to a certain point after several weeks of aerobic training, after which it essentially appears to plateau. It appears that adaptations at the biochemical level (increased ACh which inhibits the effect of norepinephrine) and of the baroreflex all seem to play a role. When I can put some more time into this I’ll try and post up some more thoughts. Thanks Andrew, I appreciate your answer and be interested to hear more from you. I asked Joel the same question and he recommended the book “Central Regulation of Autonomic Functions”. It’s too bad there hasn’t been a later edition of that book. Looks like a good one. There’s a second edition published in 2011 if that helps. Excellent. Not sure how I missed that when I looked it up. Definitely going to grab this one. Thanks.